Tradition continues with our Thursday evening paddles out on Lake Ontario! This is our 24th year presenting this Thursday evening paddle. And every year gets better! This is a favorite paddling trip for everyone! Whether you are new to the sport or an avid paddler the lake is always different. Some evenings we paddle very flat water while other evening we are out playing in the swells and waves. And every Thursday evening ends with a wonderful sunset. 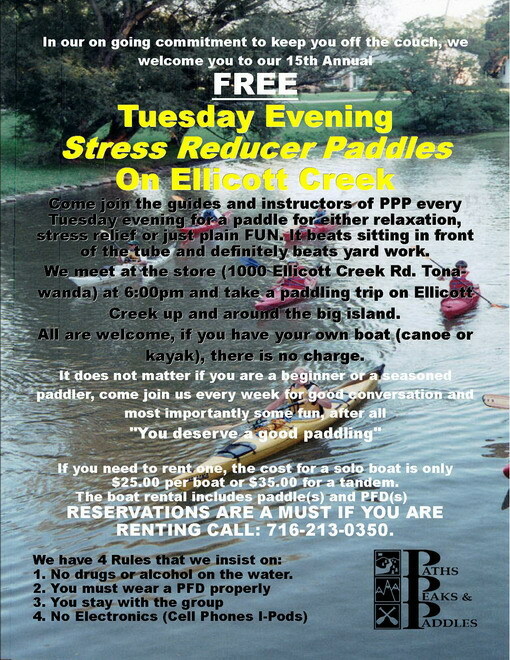 Come join the Paths, Peaks & Paddles guides and instructors for our Thursday evening STRESS reducer paddle for relaxation, stress relief or just plain FUN. It beats sitting in front of the tube and definitely beats yard work. We meet out in Wilson at the Wilson Tuscarora State Park (Route 18 East of Niagara Falls) at 6:30pm in the back parking lot. We will either take a paddling trip on either the East or West Branch of Twelve Mile Creek. To top off the evening we paddle out to Lake Ontario and watch a spectacular sunset over Toronto 38 Miles away across the lake. The vibrant colors across the sky and mirrored on the lake is breathtaking. Here you can really appreciate Mother Nature and the beauty she shares with us.